The right amount of sugar or sweetener in a cup of coffee, tea, or espresso-based specialty beverage is key to customer satisfaction. The Multi-Sweetener delivers accurate portions of sugar and sweetener products like Splenda so your customers can enjoy their cuppa joe – just the way they like it. What’s in it for you? Increased sales, cost savings, and enhanced brand loyalty for your beverage program. Contact us today to learn more about the Multi-Sweetener and how it can help sweeten your profitability! Has a slim profile and a compact footprint, and it is known for its easy plug-and-play installation. 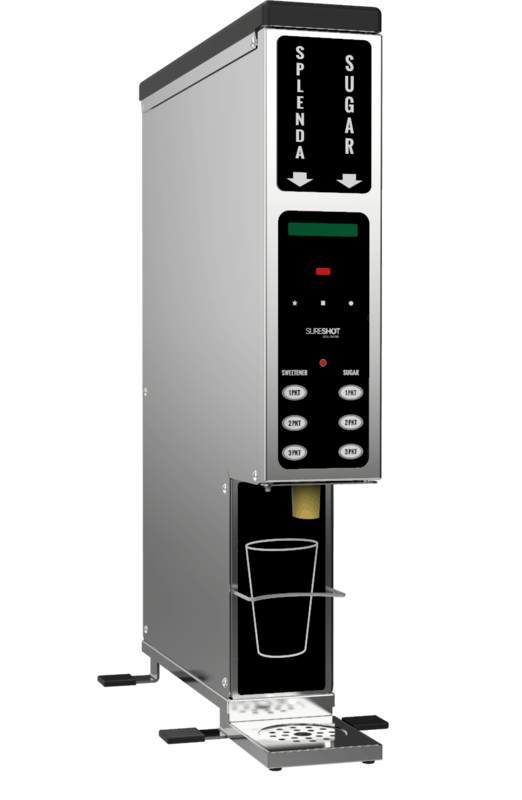 Provides cost savings by eliminate daily overuse and theft of sugar or sweetener packets. Increases customer throughput to keep lines moving fast. Is easy to clean and maintain, and it eliminates product clumping. Its infrared programmability facilitates menu changes, updates, or adjustments. Top Hopper 6 lb. / Bottom Hopper 1.75 lb. 17.75" x 4" x 25.25"
Capacity: Top Hopper 6 lb. / Bottom Hopper 1.75 lb. Dimensions (LxWxH): 17.75" x 4" x 25.25"